If you’re looking for the perfect subwoofer to boost the bass in your home theater or listening room and you don’t want to break the bank, we’ve got just what the doctor ordered. SVS is a brand known far and wide for the phenomenal quality of its speakers, and the SVS SB-1000 Subwoofer offers the perfect balance of performance and price. Add one to any system and you’ll enjoy incredibly deep bass that you can feel even at low volumes. Then crank up the 300-watt speaker and you’ll be shocked by how clear it stays at high volumes. That’s right, kiss that annoying distortion goodbye. 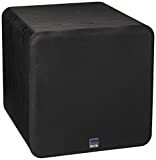 It’s a fantastic subwoofer, and it’s available right now on Amazon and on the SVS website. High-excursion 12-inch driver delivers massive SPLs with detail and musicality. 300-watts RMS, 720-watts peak power SVS Sledge STA-300D DSP amplifier for effortless power and pinpoint control at all drive levels. Rigidly braced, sonically inert and custom tuned sealed cabinet for pure, distortion-free bass, even at reference volume.